Recently I had the pleasure of participating in an ARTE (The European Culture Channel) production segment about the Miami River directed by Academy Award® nominated filmmaker Katja Esson. She has been working with her production team on a new five part documentary series – American Rivers (Amerikas Flüsse) in German and French for the European market. Thanks to artist Robin Haines Merrill of the Upper Room Art Gallery, I was put in touch with the production. Robin has been filming in the Everglades with Katja and is also responsible for bringing traditional Native arts into the public light with the Tribal Arts Project and events like Paddle Up on the Himmarshee Canal. Bringing out the big boat canoe – “Indian Head”. The better to hold the film crew! This segment shot on the Miami River at night took the film crew past some key historical sights and rarely seen parts of today’s Miami. Katja saw some of my images from a previous trip Kayak Miami – Full moon paddling on the historic Miami River and was interested in filming in the dark industrial shipyard section of the Miami River. 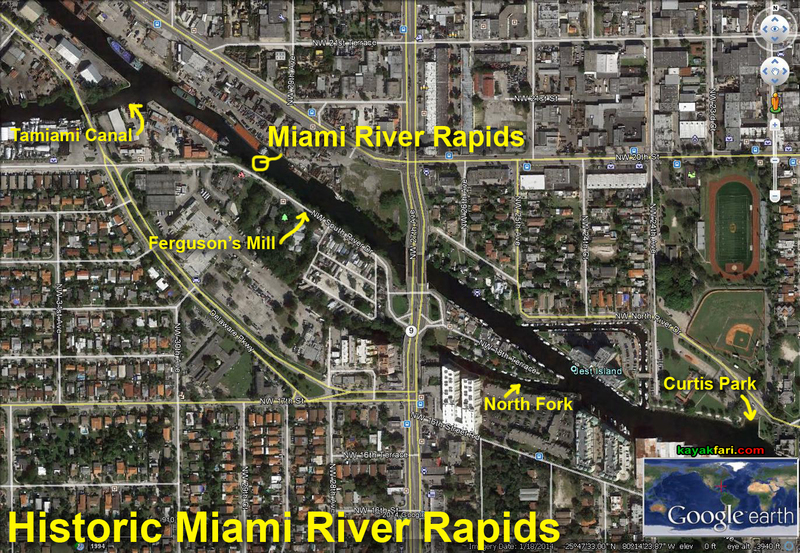 Historic points of interest on the Miami River. I chose the meet up and launch at Curtis Park for ease of access to the historical sites and the industrial shipping zone. Curtis Park has a simple boat ramp into the river that made launching easy, but there was a lot of very slick algal growth on submerged concrete. The high tide had brought in a lot of trash to the boat ramp at Curtis Park. CLICK for: All that trash – the ugly side of kayaking in Miami! Among the debris were parts of a mostly whole chicken, likely a Santería sacrificial offering. We weren’t sure if this took place on-site or just washed up with the tide. Katja Esson and crew filming on the dock at Curtis Park. This 17 foot Coleman canoe easily accommodated Katja, the cameraman and myself while they filmed before sunset on the Miami River. Production crew powerboat was provided by the folks at Gandara Marine on the river. They’ve been there about 30 years and have seen Miami change and grow. It’s interesting that the two boats are the same length! Between Curtis Park and the Tamiami Canal connector there once were actual river rapids back when the Miami River was still free flowing! There is nothing left of that today except a very small park bearing the ‘rapids’ name. At the entrance to the Tamiami Canal connector on the Miami River. We were just in time to see this old swing bridge from 1922 open and close for some boat traffic! Paddling a canoe of this size solo took some decent effort on my part. Going ‘upstream’ there was some current so I switched to a 230cm kayak paddle to make the best of it. Past the Tamiami Canal connector the water was still and flat which added to the eerieness of the experience! Paddling through the eerie industrial darkness on a previous trip. Once past the Tamiami Canal connector there was no more powerboat traffic, just the large ocean going freighters, barges and lights, sounds & diesel fumes! Production team in the powerboat as I paddled along past giant freighters loaded with old SUV’s and mattresses bound for the Caribbean Islands! Interestingly I was both a guide and a subject for the film crew as we cruised the eerie industrial darkness of the Miami River canal! Solo paddling a canoe on the Miami River canal for the camera. For some reason this pic makes me think of the historic 1975 Soyuz-Apollo spacecraft docking in orbit. Striking parallels: “Jesus is the Rock” and the industrial rock quarries on the Miami River canal that have literally built the foundation of modern South Florida! 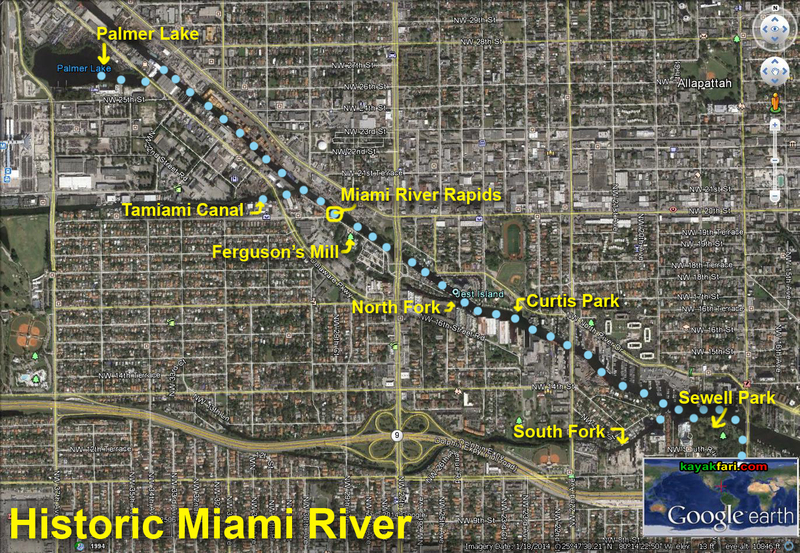 CLICK for: River of Grass Canoe Expedition 2014 – City and civilization on the Miami River Canal. You may also like ‘Perspectives on the Miami River‘ from Kayakfari ART! CLICK for: ART of the Miami River – Perspectives of water and people on the move. Waving goodbye to Katja and crew as they continued on with their production schedule. ‘Indian Head’ at Curtis Park after a successful trip on the Miami River canal. Special thanks to Katja Esson and a big thanks to Robin Haines Merrill for this opportunity! The finished film is brilliant and you can watch it in either German or French. Sorry, the English version is pending US distribution! CLICK for fullscreen video that opens in a new tab. I drove back home along Okeechobee Rd which parallels the river while reminiscing of another canoe trip down the Miami River in 2014. CLICK for: River of Grass Canoe Expedition 2014 – Miami River Canal out to Biscayne Bay. I thought of how dramatically the Miami River has changed over the last 100 years. The remote Macks Fish Camp further up on the canal is about as close as we can get to that ‘old time’ feel today. CLICK for: River of Grass Canoe Expedition 2014 – Miami River canal paddling in a Water Conservation Area.